With the demand for professional raagis increasing worldwide, hundreds of youths from rural Punjab are carving out a mellifluous career by getting trained in the divine music genre at the Department of Gurmat Sangeet at Punjabi University in Patiala. The department, which offers a post-graduate course in Gurmat Sangeet, teaches students all the ragas and hymns contained in the Guru Granth Sahib and raga-based kirtan chaukis, as per the maryada. 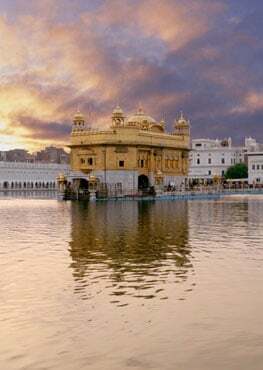 As some of the students take up jobs in overseas gurdwaras, workshops on communication skills in English are also held. With the department helping students imbibe traditional Sikh values, it has allayed the fear of many Sikh parents, who felt that their children were turning away from their culture. Parents of Saurab Meet Singh, a resident of Patran who is getting trained in taus instrument, feared that their son would wean away from Sikhism and adopt the Western culture after joining college. "I feel attached to Sikhism after I joined the department. I think the Gurus preached in the simplest form. And now, my parents are contented," he said. Besides the gurdwaras of the country, including the Golden Temple, Sikh missionaries and temples in Europe, Singapore, Canada and the USA recruit professional granthis from Punjab and are ready to give hefty pay packages. Apart from the divine connection that this genre provides, students get a chance to go abroad riding on this degree. “With this course, getting a visa and work permit in a foreign country becomes easy, besides the job is respectable. This is adding to the popularity of the course. Every year, we get more than 25 students in each group,” Dr Gurnam Singh, head of the department, said. "Employers want that students should be well-versed in English, so that they can train others abroad. Therefore, we have made English compulsory in the syllabus," he added. "Though it is hard to teach English to these students, most of whom are from the rural background, they understand that once absorbed by gurdwaras abroad, it will be an asset for them," said Amanjot Kaur, an English teacher. Students, Rajender Kaur, Kamaljit Singh and Pardeep Singh, who are studying for a bachelors degree in Gurmat Sangeet, said no one in their families was in this field, but they wanted to adopt it as a profession. “Rabab, tanpura, sarangi, israj, dilruba and tabla that the Sikh Gurus used to preach had been consigned to oblivion. But the department has revived the traditional art form,” they added. According to a senior ragi, Gurdev Singh, who had earlier served at the Golden Temple, Gurmat Sangeet was pushed into forgetfulness by unqualified teachers and self-styled Sikh kirtankaaris. "Raag parbandh, singing style and prescribed string instruments are very important and only professionals can do justice to it," he said. As the Shiromani Gurdwara Parbandhak Committee (SGPC) and the Delhi Sikh Gurdwara Management Committee (DSGMC) do not produce professional raagis for their gurdwaras, the department is catering to their huge demand too. "One of our seniors is earning over $ 3,000 per month as a Gurmat Sangeet teacher in Singapore," said Sunita, a student who hails from Khambra village in Jalandhar. However, she added that though women were not allowed to perform kirtans in gurdwaras, she could secure a job in schools and colleges as a trainer. Notably, the department, set up in 2004, was the brainchild of Bibi Jasbir Kaur Khalsa, former Vice-Chancellor Swarn Singh Boparai and Gurnam Singh. "While Bibi Khalsa of Guru Gian Parkash Foundation looked after the financial aspects, the V-C helped in setting up the chair and lookied into our problems," said Dr Gurnam. "We have 97 per cent placements in various gurdwaras, colleges, schools and music academies across the globe," said Kawaljit Singh, who teaches vocal music. Unlike Indian classical music, Gurmat Sangeet could not evolve into a distinct discipline due to self-styled teachers and their poor knowledge. Then, Punjabi University stepped in to salvage the lost art. "It is a very difficult tradition, as the prestige and responsibility of the professionals lie in preparing qualified kirtankars, who can help spread the fragrance of Gurbani," said former V-C Swarn Singh Boparai. Punjabi University Vice-Chancellor Jaspal Singh said the Gurmat Sangeet Department was one of its kind in the world. The university has also constituted Gurmat Sangeet Development Committee for patronising and guiding the Gurmat Sangeet project. The committee comprises Surinder Singh Bandhu, Bhai Ashok Singh Baagrian, Jasbir Kaur Khalsa, Uttam Singh, Jaspal Singh, Ajit Singh Paintal, Jodh Singh, Jagir Singh and Jaswant Singh. According to Gurnam Singh, Gurmat Sangeet was made popular by the first Guru Nanak Dev, who preached along with his disciple Bhai Mardana, a rababi. "All the Sikh Gurus used poetry and certain musical instruments to sermonise," he added. The department plans to launch online teaching of 'G-music' (Gurmat Sangeet) along with short-term certificate courses for NRIs and others. President of Sikh Leher America, a US-based organisation, Harbhajan Singh has started a Rs 1,500-per month scholarship for students. The department is ready with a devotional musical album, featuring topmost names from the Indian music industry. "While Jagjit Singh is composing the music, Sonu Nigam, Roop Kumar Rathod, Hans Raj Hans, Hariharan, Shankar Mahadevan and Ashwani Bhende will lend their voices to it," said Gurnam. Besides, a seven-CD album on Gurmat Sangeet has been completed and it features teachers and students of this department. Due to the initiative of the department, kirtans at the Golden Temple have started including a musician and traditional singers, thus increasing job opportunities. "We had offered a proposal in this regard to SGPC president Avtar Singh Makkar, and he accepted it," said Gurnam. The department had to conduct numerous researches before they could actually find the original instruments that were used by the Gurus. "While Guru Nanak Dev used rabab, Guru Amardas and Guru Arjun Dev took the help of saranda. Guru Hargobind reinvented taus, while Guru Teg Bahadur experimented with mridang and Guru Gobind Singh made dilruba and tanpura important partners in the musical journey," said Ali Akbar, a rabab teacher.